Imo State Governor, Rochas Okorocha, has said that President Muhammadu Buhari is being taken for granted. 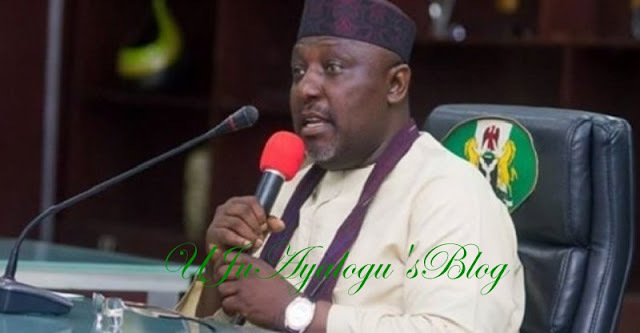 Okorocha was reacting to the recent invasion of the National Assembly by men of the Department for State Service, DSS. Ujuayalogu'sBlog reported last Tuesday that men of the security agency stormed the National Assembly complex at early as 6:am, blocking the entry and exit points. Okorocha, who spoke yesterday at a media parley in Owerri, the Imo State capital, said the face-off between the legislative and the executive arms of government in the country was unfortunate. READ ALSO : Saraki’s visit to the General in Minna, interpreted by Presidency, as going to ask: ‘Oga I hope I am doing well? Asked to comment on the DSS action at the National Assembly, Okorocha said, “We have never had it this bad in the face-off between the executive and the legislature. It is unfortunate. “People took the humility and sincerity of purpose of President Muhammadu Buhari for granted. “Usually, no President or Governor would sit down and watch a speaker that he has not supported to emerge. “But this is the first time in the history of Nigeria politics with regard to the National Assembly that the President said that whoever you like, you can make your leader, I don’t care.